"50/50: Rethinking the Past, Present, and Future of Women + Power," the 20-minute documentary from Emmy-nominated filmmaker and Webby Awards founder Tiffany Shlain, absolutely slays me. It encompasses the 10,000-year history of women in power, while illuminating the events and game-changing figures that shifted the gender balance, leading us to our current place in the fight for equality. I love the way that Tiffany thinks about these issues, reframing the narrative of our history from one of scarcity to one of fact so that we can move forward in a more clear-eyed manner. She takes complex topics and ideals and boil them down into digestible and entertaining entities that can be easily grasped and embraced. The film premiered on Oct 27th, 2016 simultaneously live at #TEDWomen and 275 TEDx’s globally, online on @Refinery29 and on TV on Comcast’s Watchable. It is the most viewed long-form film Refinery29 has released with over 4 million views to date. 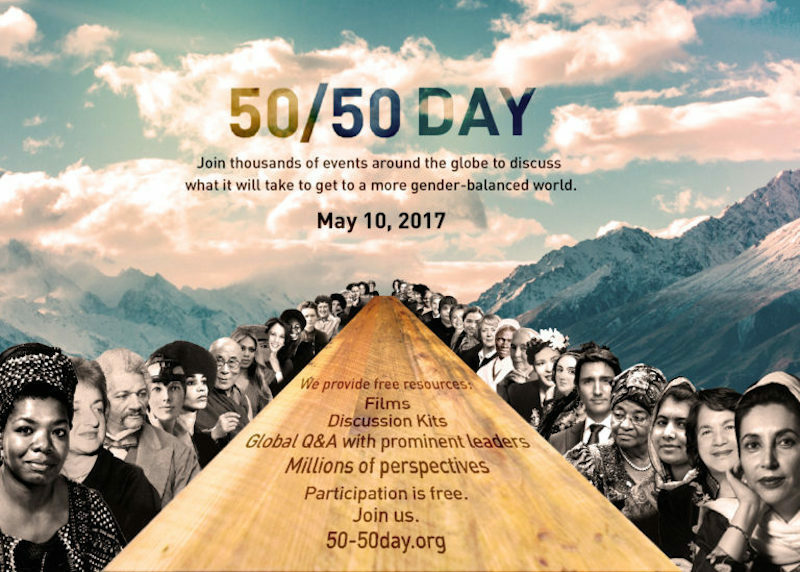 On May 10th, the picture is poised to be the centerpiece film for a global conversation about what it’s going to take to get to a more gender balanced world across all parts of society: business, politics, economy, culture, home, etc. This year, May 10th will officially be dubbed, "50/50 Day." Thousands of companies, schools, organizations, and homes around the globe — women, men, all genders, all ages — will screen Tiffany's film, engage with discussion materials and join a 24-hour global LiveCast Q&A featuring prominent leaders discussing the intersection of gender and economics, health care, environment, politics, race and so much more. Everything is free thanks to generous grants and donations. Sign up for 50/50 Day at the film's official site. You can also share the hashtag, #GettingTo5050, on Facebook and Twitter. Below is the embedded link to Tiffany's full movie.